I’ve heard a lot of things about The Dark Days Club. I’m a huge sucker for historical fiction and if historical fiction is combined with fantasy then I’m bound to read it! AlthoughThe Dark Days Club was more of a historical fiction to me instead of a gothic/fantasy book, I was still interested enough to try reading the next book. So, this book was kind of boring. But, on the bright side, the ending was kind of fun to get through! I mean, I would’ve liked this book a lot more if there wasn’t so much build-up and all that stuff. I kind of felt like I learned more about Helen and her life than about the fantasy aspect of this book. I don’t really like the whole love triangle thing with Lord Carlston and the Duke but, really, at least Helen isn’t annoying for the love interest. I kind of guessed Berta had something to do with the Deceivers. Also, I just think that rationally if Helen were to choose someone, it should be Lord Carlston because she wouldn’t have to hide any secrets from him. 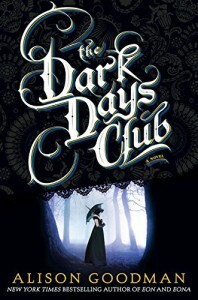 Overall, The Dark Days Club was an okay book that had more of a strong beginning and end (in my opinion). I had to really push through the middle portion and was really happy whenever I got glimpses of fantasy, but oh well.